The Plough Inn is on Friargate, which formed part of the mediaeval town of Preston. It’s proximity is adjacent to the ancient and formally important junction of Friargate and Fryars Lane (which later became Bridge Street, then Marsh Lane which it is called currently). As well as being the road to the Franciscan Friary of the Grey Friar Monks, it was also the road to the ford across the Ribble, prior to the formation later of bridges – being the main road south to Penwortham, Liverpool and beyond. 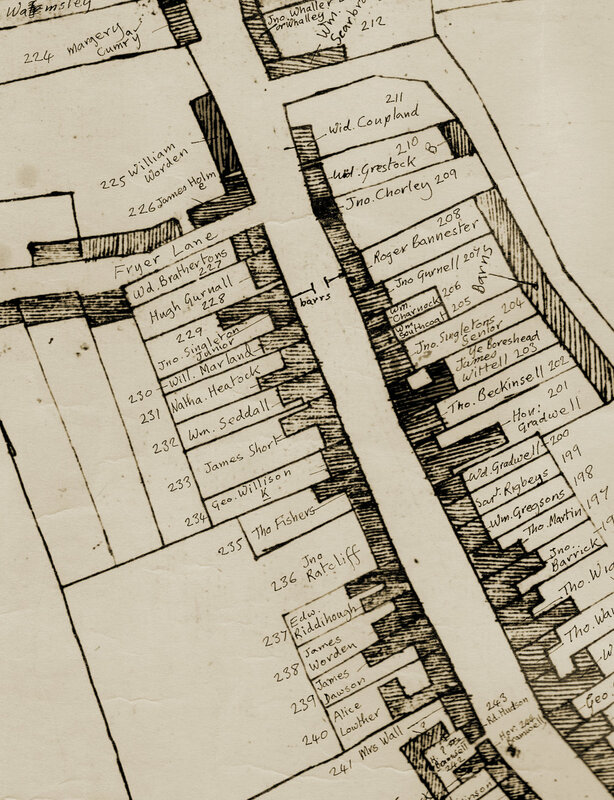 Our current building was constructed by John Chorley in we think 1668 on the site of a previous unknown building. There have been many changes to the building in the preceding years, the principle building is undoubtedly the same structure that John Chorley built 350 years ago. The Chorley's were a puritan family in the 17th Century and were much involved in the administration of Preston with several members of the family becoming Aldermen's or Mayor of Preston, including John Chorley Snr and Jnr. Their portrait can be seen in the Harris Museum. The family were Butchers and Haberdashers by trade and we think The Plough Inn started life as a Butchers shop and home in the 17th Century. Certainly elements of the cellar, including the stone tables with drainage run off channels would suggest the cellar was used as an abattoir /meat hanging area. In the 18th Century, later male descendants, with the family name of John Chorley moved to Liverpool and Jamaica and sadly became involved with the slave trade, running the Preston Plantation in Jamaica. The next record we have of our building is in 1732 when it was owned by the Baroness Catherine Petre, as part of her extensive estate. Catherine was born into one of Lancashire’s wealthiest families - The Walmesley’s of Rishton. The families ancestral hall is still standing, Dunkenhalgh, in Clayton Le Moors and is now used as a hotel. She was the last of the Walmesley’s, inheriting the family’s wealth at the age of 13. On 1st of March 1712, she married Robert Petre, 7th Baron Petre, bringing him a dowry of £50,000 – a huge amount of money at this time. Lady Petre was an ardent Jacobite who had been considered as a possible spouse for Bonnie Prince Charlie and even James Stuart “the Old Pretender”. The marriage was cut short by Lord Petre's death from smallpox just one year later. She later in 1733 married Charles Stourton to become Baroness Stourton, dying in 1785 at the ripe old age of 88. The property at this time was occupied by Thomas Shawe and his Wife. So far we have no other details about them. Where they Innkeepers at The Plough Inn or did the building still have a different use then? We do not know when during the 17th/18th century the building was converted to The Plough Inn. The first written records of its existence are the bribes paid in The Plough Inn during the 1795 election to elect Lord Derby. During canvassing for the Preston Election, held March 26, 1795, agents of the successful candidate, the Earl of Derby, spent £187 – 0 – 6d bribing the locals in the Plough to vote for Derby. This was a great deal of money then, which suggests the Plough Inn was well established by this point. Dram Shops or Spirit Vault were names given to Gin Shops and was a product of the Gin Craze of the 18th Century, which was an epidemic in Georgian Society. Gin was introduced into Britain in the late 17th Century by the Dutch King of England William III. Production and sale was almost completely deregulated in order to stem the flow of imported spirits such as Brandy from France a ‘free Gin’ policy. This policy proved to be a disaster. Within a few years 7000 Gin Shops appeared all over England. By 1749, in London alone, of the 96,000 houses, 15,000 sold alcohol and 9000 of them were Dram Shops. The gin-shop owners would sell their drink under fancy names like 'Cuckold's Comfort', 'Ladies' Delight' and Knock-me-down', a mixture of hot spiced ale and punch. A Dram is a measure of Spirit which is the equivalent approximately to a ¼ of a pint of liquor. Gin or Dram Shops started off in Chemist shops and in many ways were more like shops than Inns. 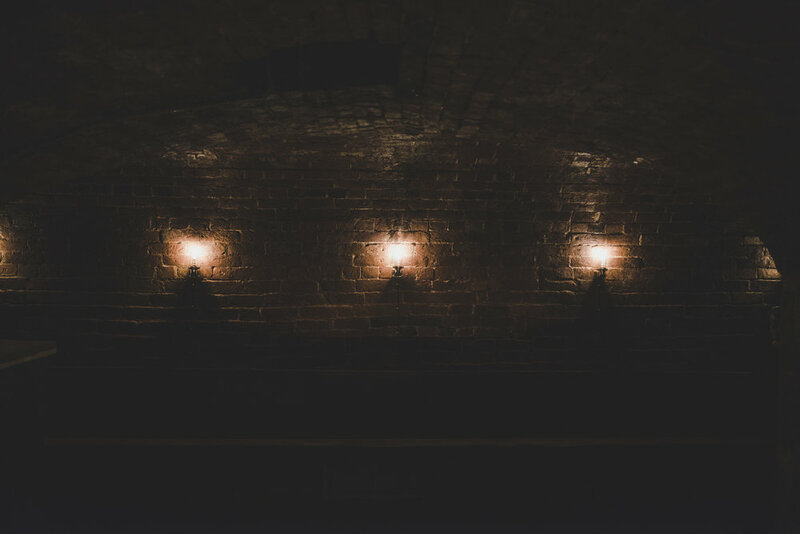 They were often located in dismal cellars, hence the term Spirit Vaults, with the term referring to vaulted cellar rooms that contained them. 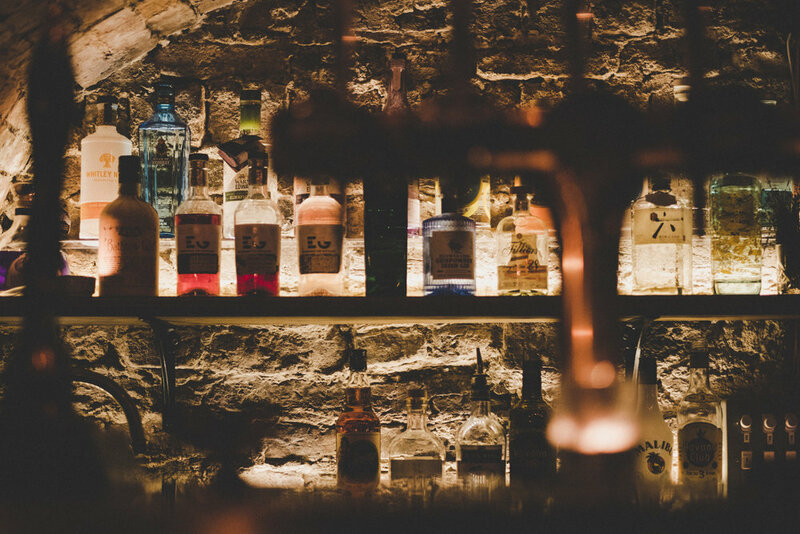 There was little in the way of comfort, with no seating, just huge vats of Gin waiting to dispensed to patrons, who were expected to have their drink and go or fill up their vessels to consume later. In Hogarth’s Gin Lane picture above you can see the cellared steps to the Dram Shop in the bottom left of the picture. TO  BE  LET and  possession  to  be  had  on  May-day  Next. THAT well-accustomed  PUBLIC-HOUSE, known by the sign of the "PLOUGH," together with the DRAM-SHOP attached, eligibly situated in Friargate, and well-adapted for carrying on an extensive business. There is documented evidence of The Plough Inn having a Dram Shop. The entrance to the Dram Shop will have almost certainly been completely separate to that of the Inn and is likely to have been situated off Plough Passage an ancient road that ran between Friargate and Back Lane (Market Street West). The “Spirit Vault” was listed again in the sale particulars of 1854 for The Plough Inn. However, with the growing public health concerns and the rise of the temperance movement, The Dram shop was legislated out of business around this time. During our renovations, we rediscovered The Vaults, filled to the brim with rubble and bricked up. 50 tonnes of rubble removed later, The Spirit Vaults started to come back to life, more than 160 years after their closure. In 2018 The Dram Shop reopened, and a drink can be enjoyed again in this atmospheric and timeless space, albeit with a little more comfort than if you had wandered in from Plough Passage in the 1820s. There are numerous records of brushes with the law both customers and landlords of the Plough Inn had throughout the latter part of the 19th Century. It was a similar story at a number of the surrounding small inns and taverns on this part of Friargate, which had a reputation as a less salubrious part of town. In the 1890s its name was changed to the Hotel National, possibly to get the venue away from its previous reputation and modernise its image. However during the 1890s/1900s the temperance movement was at the height of its powers and disquiet was growing over signs of public drunkenness. The old and small taverns, inns and beerhouses were seen as the problem - decrepit, dirty and lawless. The lawmakers and local Government set about getting these closed down, to be replaced by fewer “bigger and better” pubs in what became known as the “improved pub movement”. In the period between 1890 and 1925 Friargate lost more than half of its pubs with Magistrates revoking their licenses. The Plough Inn succumbed in 1913 when last orders was called for the final time. Others included the neighbouring Crown and Thistle, Roast Beef Tavern, Prince Of Wales, Empire Inn, Old Sir Simon, North Lancashire Hotel and many others in Friargate and beyond. The Plough Inn stayed empty through WW1 and was next opened in 1923 as the short lived Bells Restaurant. After this time the building has had various uses including a fish and chip restaurant, furniture store, a watch makers, alternative clothing shop and latterly Ozone - retro clothing and body piercing. In the 1950’s the building was bought by the Odd Fellows Society and the upper floor used as the meeting hall right upto the 1990’s. Some 105 years after last orders we have stripped away all the modern fittings to get back to the essence of the old Plough Inn, restoring and re-imaging this space, with gin and beer flowing once again in this historic Preston drinking hole. The front part of the cellar has been identified by a specialised historian as containing the remains of a small Gin Distillery. 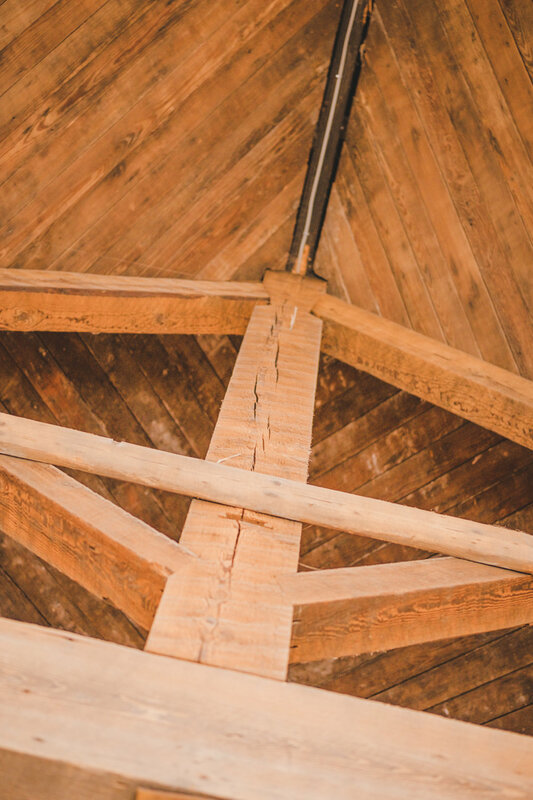 There is a mash pit for pulping the grain and horse-shoe shaped shelving, with water run offs, which held Gin Stills. Small scale Gin production had been largely outlawed by the last part of the 18th Century and the construction is too permanent to be an illegal Still, so the likelihood is this dates from the “Gin Craze” days of the first part of the 18th Century, when Gin production was liberalised to encourage domestic spirit production. After the clearance of the Vaults, as part of the repairs, the decision was taken to remove what remained of the brick floor and to dig down to help try and make the cellars watertight. Water ingress was a big problem in there at that point, however one area of the floor always puzzled us. When the rain water came in, it never puddled – it drained away here as fast as it came into the cellars. It was the end of the day, but curiosity got the better of us and we decided to have a little dig. About a foot under the brick, we started to find stone. Well that was it, we continued digging well through the night and into the early hours of the next morning. It started to become apparent that we had found a stone well and pulled out lots of pottery, clay pipes and even a domino piece made of bone. Over the coming months, the well was excavated below the water table, to a depth of 43 foot. The large, stone well is of exceptional build quality for such a structure, being constructed of uniform Ashlar Sandstone blocks for the full depth of the well, which suggests it was built by a an individual or organisation of high status. The well clearly predates the current building which is brick built  There are footholes carved into the walls to allow the climbing of the well. In the first six feet or so we removed a good deal of pottery and clay pipes etc. A number of items we found can be dated from their inscriptions and all date back to the 1850s, which is we can assume when the well was infilled as Friargate received running water at around this time. The well has been identified as being almost certainly of medieval origins, built at some point between 1100 and 1600. In Preston, were nothing visible remains from this period, this is significant find. We have found no written references to the well. With the quality of the build, could the well have been built by the Monks of the Grey Friars Friary? The Plough Inn is built adjacent to the Grey Friars estate. Or was it part of the nearby Preston Manor House which was located about where the BT building on Moor Lane is today. Perhaps we will never know. A part of The Battle of Preston during the Jacobite rebellion of 1715 took place right outside the site of The Plough Inn, with defences at the Old Toll Bar Gate on Frairgate. Pictorial representations of the battle show many burning buildings in this part of Friargate and it is entirely possible the current Plough Inn building was constructed on the site of a building damaged by the battle. The Plough played a part in one of the major personalities of the temperance movement taking the pledge. In the autumn of 1832 John Finch again went over to Preston to see how his business partner and “convert” was going on, and he then discovered that Thomas was a total abstainer from all intoxicating liquors, having found it impossible to drink ale and wine in moderation and keep sober. This happened when, one day, while sitting drinking in The Plough Inn on Friargate, he found himself ordering a fourth drink. He held it in his hand and began to talk to it – “Pretty sparkling thing, may I taste thee? Then I am undone forever, for this is my last chance for reform! I will not – cheat, deceiver, liar, thief. Devil thou art, I will not taste thee again for twelve months.” He thought about the twenty shilling hat that Finch Jnr had promised him and he ran home and knelt down and prayed to God for strength to help him keep his resolution, which he had managed to keep right up to Finchs’ meeting with him. Thomas said, “I shall keep it as long as I live, for I am quite sure, from my own experience that nothing short of total abstinence from all intoxicating drinks can either reform drunkards, or prevent moderate drinkers from becoming drunkards.” Thomas became a total abstainer on Shrove Tuesday, (6 March), 1832. Finch agreed that he would also abstain totally and would take the message back with him to his Liverpool society. It could therefore be said that Thomas Swindlehurst was surely the first recorded person to say that an alcoholic cannot drink in moderation, but must abstain totally from it if they are not to fall back into drink dependence. The pledge of total abstinence or becoming “teetotal” that Thomas Swindlehurst took in The Plough Inn that night in 1832, as opposed to the pledge of moderation was seen as one of the pivotal moments in the Temperance movement in the 19thCentury.